Locks are mechanisms that have been around over 6,000 years and, as you can imagine, locks have greatly evolved. Those in the ancient Mesopotamian kingdom of Assyria were presumed to have the first lock and the Egyptians had the first mechanical lock that utilized a pin tumbler that was made entirely from wood. The Greeks and Romans made their lock predominantly from metal and many in those cultures would wear a necklace or ring with a key attached or infused into it. After the fall of the Roman Empire, new innovations in locking mechanisms ceased until 1778, when Robert Barron invented a lock with a double-acting tumblr. Since locks and the keys that go with them have evolved greatly over the the millennia, there are, as you would presume, numerous kinds of locks to choose them. Today on our blog we will be looking at the basic types of locks utilized by modern users. A padlock is one of the most common freestanding locks and has been used since ancient Egypt and Babylon. The first laminated padlock to be patented was in 1924 by Harry Soref of Master—a lock company still around today. There are two main types of padlocks including combination padlocks like those used on school lockers at in gym locker rooms. The other main type is the key-based padlock, which as the name suggests, uses a key versus a combination to open and lock. Most of us know what a deadbolt is for it is the traditional lock used on the front door of most modern suburban homes in Spring for the key of the lock must be inserted and turned for the lock to open. The first deadbolt or “jimmy-proof lock” was invented in by Samuel Segal, a former cop who in 1912 founded the Segal Lock & Hardware Company. Today, there are several variations on the original design: single cylinder, double cylinder, lockable thumbturn style, and jimmy-proof deadbolts. Variations of lock-in handle locks are commonly used in Spring homes as well. Usually these locks, which lack the secure of a deadbolt, are paired with a deadbolt when these locks are used on residential home locks: It is suggested that if you don’t have a deadbolt on your door to have your local locksmith install one, for hammers, pliers, and other tools with some force can be enough to knock the knob off and allow the intruder inside easily. Types of in-handle locks include: lever handle, vending/t-handle, and knob locks. 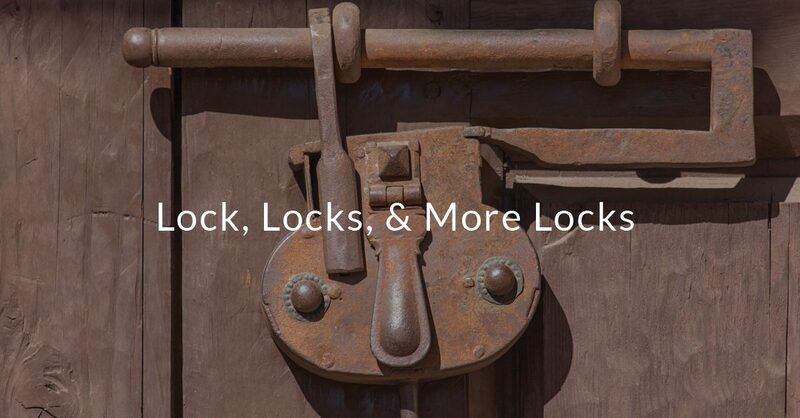 These are just some of the main types of locks still used today. Stay tuned for a follow up blog to learn more about modern types of locks and to find out if your home, lock box, and business are really as secure as you think. The locksmiths of Affordable Locksmith of Texas are here to assist you in finding a lock that will secure your home or business in the best way possible. Contact us today!